PE’AHI, Maui/Hawaii (Friday, November 11, 2016) – Billy Kemper (HAW) and Paige Alms (HAW) have claimed victory at the World Surf League (WSL) Big Wave Tour (BWT) Pe’ahi Challenge after a thrilling day of competition in 30-foot-plus surf that saw Kemper take back-to-back event wins and Alms become the first ever WSL Women’s BWT Champion. Kemper and ratings leader Grant Baker (ZAF) shared a wave to open up the Final, with Baker getting the best of the exchange. Reigning BWT Champion Greg Long (USA) followed quickly on the second wave of the set and took the advantage with an excellent 8.83. Long backed up his first score on one of the bigger waves of the day with another excellent ride for 8.93. Kemper pulled into a barrel at the halfway mark to earn a perfect 10 and take the lead from Long and push Baker into third place, despite an excellent 8-point ride from the South African for a late drop. A final attempt from Nic Lamb (USA) moved him up into fourth place over Pedro Calado (BRA) and Will Skudin (USA) who finished in fifth and sixth place respectively. Kemper held the lead through the remainder of the heat and closed the Final with a 9.07 for pulling into a deep pit and sealing his second consecutive win at Pe’ahi. The result sees Kemper move up nine places to No. 4 on the BWT rankings while Baker retains the ratings lead with only two possible events remaining on the 2016/17 season. 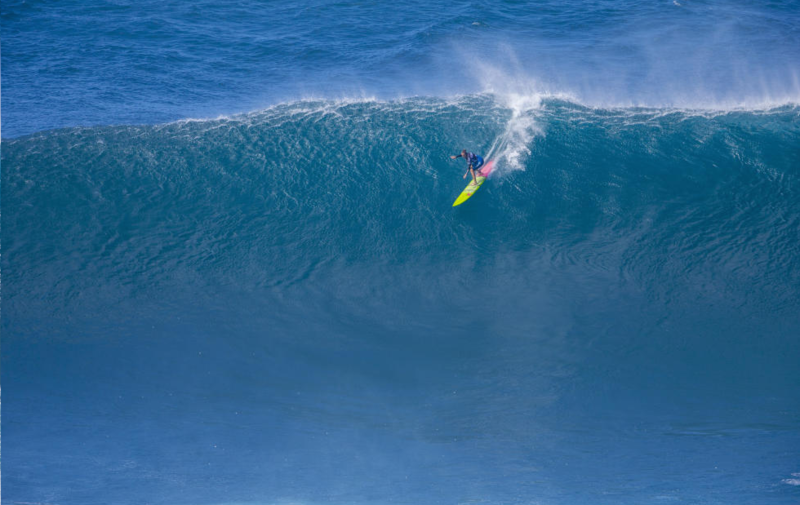 Paige Alms (HAW) has become the first ever Women’s Big Wave Tour Champion after taking a commanding victory in the Final of the Pe’ahi Challenge. 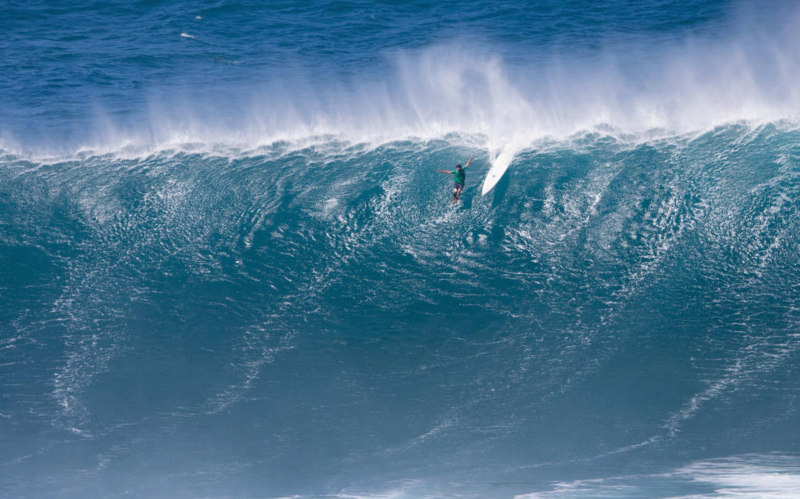 The world’s best female big wave surfers made history today as 12 individuals took to the water to compete in a WSL Big Wave Tour event for the first time ever and contest for the maiden women’s title in heavy conditions at Pe’ahi. The Final saw Alms, Justine Dupont (FRA) and Felicity Palmateer (AUS) take to the water for a 60 minute match-up. Finalists Keala Kennelly (HAW), Emily Erickson (HAW) and Laura Enever (AUS) were unable to compete after sustaining injuries in Round 1. Dupont led the charge, opening her account with a 3.17. Alms was close behind in second place for the opening half of the heat until she found an incredible wave and took off with perfect positioning and was rewarded with 6.00 and the lead. The Hawaiian continued to dominate the heat, putting it all on the line with another impressive ride for a 7.83, one of the day’s top scores. Dupont tried to fight back but it wasn’t enough, and she finished the event as runner-up with Palmateer taking third place. Before the Women’s Final got underway Baker opened Men’s Semifinal 1 with a 4.67. He backed this up with a 4.17 in the closing minutes to move up into third place and earn his place in the Final. Reigning WSL Champion Long took an early lead in the bout with a 5.83 and found his second wave and his first left of the day to advance to the Final. Kemper pulled into huge barrel that shut down on him but he was rewarded for his commitment and finished the heat in second place. CT charger Josh Kerr (AUS) finished in sixth place after opening with a smooth ride for 4.07. On the hunt for a place in the Final Kerr went after another score and was rewarded with an intense wipeout and a broken board. Kai Lenny (HAW) and Cristian Merello (CHL) were also eliminated after finishing in fourth and fifth place respectively. Lamb opened Semifinal 2 with a bang and a 7.17 for a critical drop and took a healthy lead over his competitors. Lamb maintained control of the heat from start to finish to earn his place in the Final. Callado, held second place with a 12.67 heat total for two solid waves while Skudin took third place to edge through to the Final ahead of Hawaiians Yuri Soledade (HAW), Aaron Gold (HAW) and Shaun Walsh (HAW). Following the conclusion of Men’s Round 1 Kennelly was first to put a score on the board in the opening heat of Women’s Round 1, with a 6.83 and the lead. Kennelly left the lineup for medical attention following after suffering a knee injury. Despite this, Kennelly held on to her first place position. Dupont took second place thanks to a 2.83. With ten minutes remaining Dupont found a backup score on a smaller wave to secure her place in the Final. Erickson also suffered a heavy wipeout early on in the heat and was also forced to withdraw. Silvia Nabuco (BRA)remained scoreless and was eliminated alongside Polly Ralda (GTM) and Andrea Moller (BRA). Round 1 Heat 2 saw current No. 10 on the WSL Women’s Championship Tour, Enever, dominate the lineup from the start of the heat and was first to attempt a ride. Despite an unsuccessful takeoff she was rewarded with a 0.74 that gave her an early advantage. Enever and Felicity Palmateer (AUS) both committed to the next wave but it was Palmateer who made the drop and earned a 5.50 for second place. Maui local Alms looked in control and at ease and posted a solid 6.17 with her first ride to claim the lead. Bianca Valenti (USA) continued to charge, despite two heavy wipeouts, but wasn’t able to find a score of significance and she finished in fourth place. A late drop from Jamilah Star (USA) moved her up into fifth place but it wasn’t enough to advance to the Final and she was eliminated from the competition alongside Tammy-Lee Smith (ZAF). Alms, Palmateer and Enever moved forward into the Final. The opening round of the men’s competition saw it’s share of upsets with 2014/15 BWT Champion Makuakai Rothman (HAW) being eliminated after a heated battle in Round 1 Heat 3 which saw him finish in fifth place with an 11.53 heat total. Damien Hobgood (USA) and Shane Dorian (HAW) also failed to advance on in the competition after finishing in 4th and 5th place respectively in Round 1 Heat 4.